Condensing is the act, or practice, of condensation in any form. Condensation is the change of the physical state of matter from gaseous phase into liquid phase, and is the reverse of evaporating. It usually occurs when a vapour is cooled, and/or compressed, to its saturation limit when the molecular density in the gas phase reaches its maximal threshold. Condenser coils absorb heat from the evaporator coil and transfers it to a disposal point. Sensible and latent heat is extracted from the compressed refrigerant (causing it to liquefy) and this heat is then rejected to a cooling medium. The medium may be air or water - or in the case of an evaporative condenser, a combination of both. The secondary function of a condenser is utilisation of its gas pressure to discharge liquid refrigerant to the expansion valve. 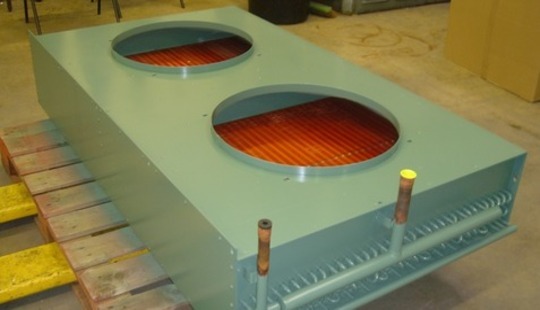 Condensers are typically heat exchangers which can be specifically designed to meet your requirement meaning we can offer many different designs/styles ranging from small (hand-held) to very large industrial-scale units used in plant processes. We design condensers for use in air conditioning, industrial chemical processes (such as distillation, steam power plants or nuclear power plants) and many other heat-exchange systems. As with all of our coils, once a design has been finalised, we can manufactured from a wide range of materials to ensure your coil is best suited for the intended application. Fin materials available are plain aluminium, vinyl coated or plain copper plus several coating options are also available for varying environments - check out our Fin Technologies page for more information. "Your condenser unit runs more efficiently when excess heat leaves the system quickly; so keeping the coils clean can lower your running costs and may also lengthen the lifespan of your system"
As condensers tend to be outside units, they are susceptible to collecting dust, pollen and other debris from the environment they are situated in - so regular cleaning and upkeep of the system is essential to get the best out of it. A stiff nylon brush, a can of commercial cleaning solution and a hose are usually sufficient to remove any build-up of dirt as long as cleaning is carried out carefully. As with interior unit cleaning jobs, turn off power to the unit before starting, for your safety and if the unit has not been cleaned in some time, it may be best to call in a professional AC service to clean the coils thoroughly.